The heart of Whistler is its pedestrianized village stroll providing a safe environment to enjoy fantastic shopping, world-class restaurants, lively nightlife and access to Whistler and Blackcomb mountains. Since the 1970's Whistler Village has seen a dramatic change, from the town's original garbage dump to the world class village you see now. Situated in the "tourist zone", most properties in the village have restrictive use covenants to ensure there are homes for tourists to rent. The Upper Village is a beautiful 5-minute walk from the main village and has it's own access to Blackcomb mountain via the Wizard Chair and Base II Blackcomb Gondola. Lost Lake provides plenty of recreational activities with cross country skiing and snow-shoeing trails in the Winter, whilst in the Summer Lost Lake is one of Whistler's favourite destinations. The upper village is also the site of Whistler's popular Summer Farmers Market. A variety of townhouse and condo complexes make up the Benchlands, many with ski-in/ski-out access, or a short walk to the nearest trail. The Fairmont Chateau Golf Course, Lost Lake, restaurants, boutique shops and Whistler's luxury hotels make this a desirable area for weekenders and tourists alike all year round. 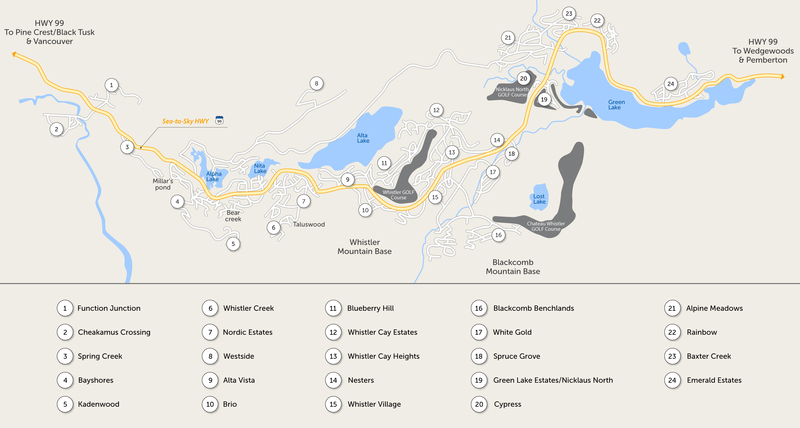 Extremely well located, close to Whistler Village, the Upper Village and Lost Lake, has ensured White Gold is a popular year-round location for locals and investment properties alike. Being one of the older neighbourhoods, there are an eclectic mix of newer homes alongside older structures. With mostly flat lots, some backing on to Fitzsimmons Creek, you can have your dream home within walking distance of the village.